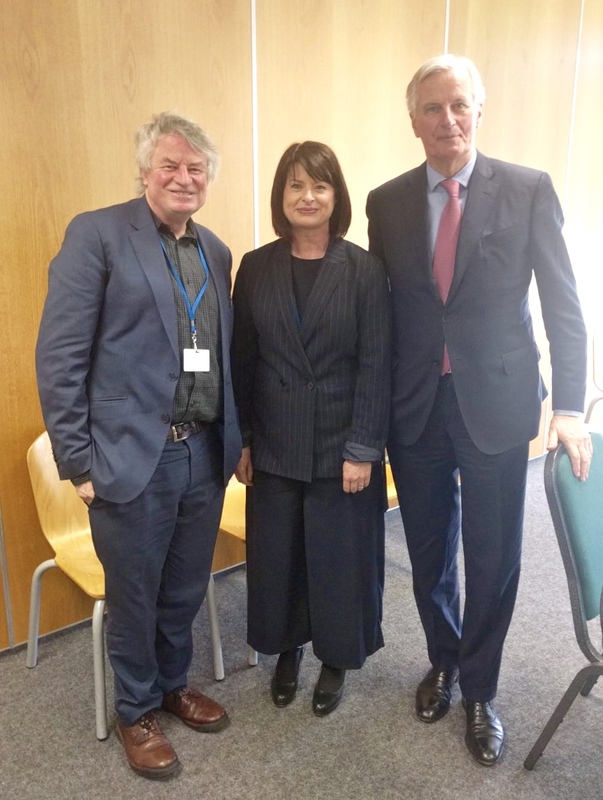 The EU Chief Negotiator on Brexit Michel Barnier has today (30th April) met with the Joint Committee established under the Belfast/Good Friday Agreement to consider human rights issues on the island of Ireland. The meeting discussed the significant risks of differences in rights protections on a North-South basis following the UK’s EU Withdrawal. Representatives of the Joint Committee consisting of the Northern Ireland Human Rights Commission and the Irish Human Rights and Equality Commission met the EU Commissioner in Dundalk today, in a meeting which followed on from recent similar meetings in Dublin with Simon Coveney T.D, Tánaiste and Minister for Foreign Affairs and Trade with responsibility for Brexit, and in Belfast with the UK Parliamentary Under Secretary of State for Northern Ireland, Lord Duncan. The Joint Committee has proposed a mechanism whereby the two human rights institutions, in their formal role under the Belfast (Good Friday) Agreement would advise and contribute its expertise on human rights issues to the process leading to the final withdrawal agreement. 1. Ensure no diminution of rights within the withdrawal agreement. 2. Safeguard the North-South equivalency of rights on an ongoing basis. 3. Guarantee equality of citizenship within Northern Ireland. 4. Protect border communities and migrant workers. 5. Ensure evolving justice arrangements do not water down rights. 6. Ensure continued right to participate in public life for EU citizens in Northern Ireland. Representatives from the Joint Committee will also shortly be travelling to Brussels for further engagements with Government representations and EU Institutions. “Brexit risks creating a two-tier citizenship in Northern Ireland. Today’s Joint Committee meeting with the EU Chief Negotiator saw a significant shared understanding of the human rights conditions which need to be met in order for the final withdrawal agreement to meet the obligations of the Belfast/Good Friday Agreement. “We welcomed today’s meeting with the EU Chief Negotiator, Michel Barnier, in Dundalk. The Joint Committee took this opportunity to discuss how the current agreed position of the EU 27 and the UK government of no diminution of human rights can be implemented in practice after the UK Withdrawal from the EU. Earlier in April, Parliamentary Under Secretary of State for Northern Ireland, Lord Duncan, met with the Joint Committee on the human rights and equality impacts of the UK Withdrawal from the EU. In February, Simon Coveney T.D, Tánaiste and Minister for Foreign Affairs and Trade with responsibility for Brexit, met the Joint Committee on the means of addressing the risks and challenges for people’s human rights and equality as the UK withdraws from the EU. The Belfast (Good Friday) Agreement‘s section on rights, safeguards and equality of opportunities, provides for a joint committee of representatives of Irish Human Rights and Equality Commission and the Northern Ireland Human Rights Commission, as a North-South forum for consideration of human rights issues in the island of Ireland. The Irish Human Rights and Equality Commission is an independent public body, appointed by the President and directly accountable to the Oireachtas. The Commission has a statutory remit set out under the Irish Human Rights and Equality Commission Act (2014)to protect and promote human rights and equality in Ireland, and build a culture of respect for human rights, equality and intercultural understanding in the State.